Click on the book cover to get it on Amazon. Paperback or Kindle. 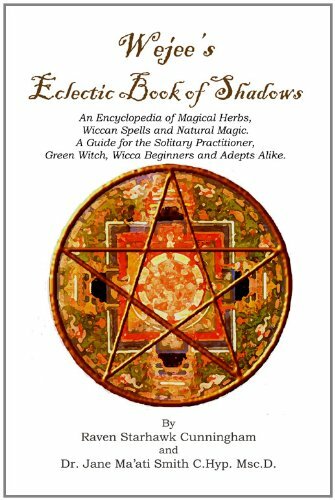 This book serves as an easy and accurate reference, with Wiccan correspondences for 117 herbs, plus essential oils, crystals, incense, trees, colors, days, moons, and dreams and potent spells for love, prosperity, protection and more. Its depth information will inspire you to new heights of creativity and power; this book steps beyond the ordinary with an empowering assortment of everyday tools to not only enhance a magickal practice, but to enhance a magickal life! With methods for incorporating Eastern concepts of the chakras, aura and Reiki into a Wiccan practice, and easy meditations and energy techniques to help you develop the power of the most essential and basic of magickal tools- the spiritual body and mind. This is a book you will want to keep on hand; it is perfect to pack into a purse, backpack, desk or car. It is a modern melting pot of pertinent and practical esoteric information, a handy, compact guide for the progressive and eclectic practitioner of modern magick!